Chelsea star Eden Hazard celebrates after scoring against Bournemouth. Maurizio Sarri’s impressive start to life in the Premier League gathered pace as Chelsea maintained their perfect start to the season with a 2-0 win over Bournemouth on Saturday. Sarri’s side appeared to be in danger of dropping their first points of the season against opponents who were also unbeaten coming into this game. But everything appears to be going right for Sarri at the moment and his decision to introduce Pedro in the 65th minute was rewarded when the Spaniard struck the opening goal just seven minutes later. 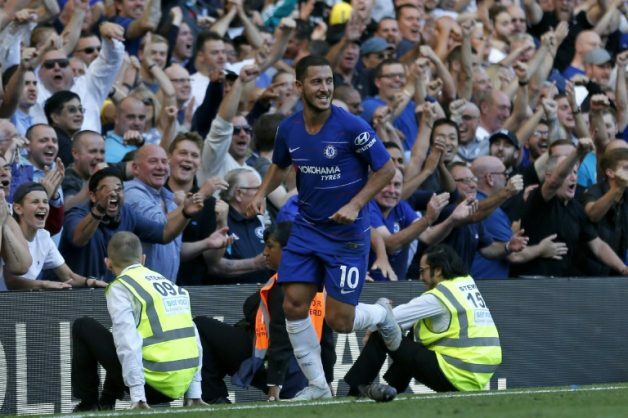 Eden Hazard wrapped up the win in the 85th minute at Stamford Bridge to make it four wins from four league games since former Napoli boss Sarri replaced Antonio Conte. Having seen Liverpool win earlier in the day, Sarri could be satisfied with the way Chelsea responded as they kept pace with Jurgen Klopp’s side at the head of the Premier League table. This game provided more evidence that Chelsea are quickly buying into ‘Sarri-ball’. Eddie Howe studied the Italian’s methods when Sarri was at Empoli and the Bournemouth manager must think he was handed another lesson after his side paid the price for a number of missed chances. Sarri had warned before the opening game of the league campaign that his side would face a difficult start as he attempted to implement a very different approach to that employed by Conte. Early results have suggested otherwise, however. Already Chelsea have demonstrated an ability to overcome different kinds of tests, recovering to claim victory after squandering a two-goal lead against Arsenal in the previous home game and finally breaking Newcastle’s resolute defence last weekend. The visit of Bournemouth was always going to provide another significant challenge with Howe’s side having won at Stamford Bridge twice in the last three years. Howe included Jefferson Lerma, the Colombia World Cup player signed for a club record fee of £25 million ($32 million) from Levante, and left-back Diego Rico for their Bournemouth debuts and switched to a back three to contain Chelsea’s threat. Yet while Chelsea enjoyed plenty of possession they created only a few chances and could easily have found themselves trailing at the interval. It was not until the 44th minute that Chelsea looked likely to find a way past Asmir Begovic, the former Blues keeper, when Marcos Alonso struck a right foot shot against the post from the edge of the penalty box. Chelsea, though, had also demonstrated a degree of vulnerability at the back, particularly when Callum Wilson was left unmarked as he met Rico’s 30th minute cross, only to divert the ball wide. Sarri’s side had offered signs of their strengths and weaknesses and were again fortunate to escape 12 minutes into the second half when Nathan Ake missed another clear chance, spooning over from just four yards following a corner. The Chelsea coach reacted by introducing Pedro and Olivier Giroud in place of Willian and Alvaro Morata and the home side started playing with more purpose. Jorginho triggered the move that led to the opening goal, playing the ball to Pedro who exchanged passes with Giroud before finishing from the edge of the box in the 72nd minute. And Hazard confirmed the victory five minutes from the end with an incisive finish following another assist from Alonso.